Clean one`s body by immersion into water. I will have a bath now. The child should bathe every day. You soak and wash your body in a bathtub. He has a good bath every morning. A relatively large open container that you fill with water and use to wash the body. 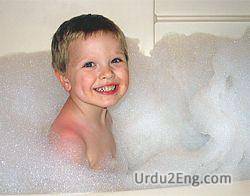 A room (as in a residence) containing a bathtub or shower and usually a washbasin and toilet.